Under California law, all kindergarteners must be vaccinated against a range of communicable diseases before they can start school. But California also permits parents to opt-out of vaccines on behalf of their children. 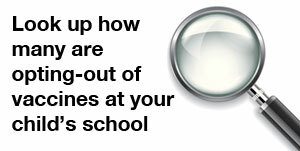 The opt-out rate doubled over a seven year period ending last school year. But now, for the first time since 1998, the opt-out rate has declined, from 3.15 percent statewide to 2.5 percent. A new state law appears to be the driver. Under AB 2109, parents who wish to opt out of vaccines must file a personal belief exemption or PBE, a signed statement that vaccines are against their personal belief. This school year, for the first time, parents must first meet with a health provider who explains the risks and benefits of both vaccines and vaccine-preventable diseases. Until the current school year, parents simply had to sign the statement without any consultation. State senator Richard Pan (D-Sacramento) sponsored the bill and is pretty happy about the decline. He believes that requiring the meeting with a health care provider clears up confusion some parents have about vaccines. "By requiring them to talk to a physician or other health provider," Pan said, "they can get more information and when they get that information, they feel more comfortable about getting their children vaccinated." "In addition, the law likely catches people who might have been too busy to get to the doctor. "In the past you could just sign before you could go to school," said Dr. Dean Blumberg of the UC Davis medical center who is involved in vaccine research. "Now since you have to talk to your health provider to sign the form, you may as well -- since you're talking to the doctor -- get them vaccinated." Blumberg provided State of Health with data from a Centers for Disease Control vaccine conference showing historical rates of personal belief exemptions in California. Rates had been comparatively low, especially after the 1989-1991 measles epidemic when there were 17,000 cases of measles and 70 people died in California. Vaccine rates need to be 90 percent -- or higher -- depending on the disease to create what's known as herd immunity. That means that enough people are vaccinated to protect those who cannot be vaccinated for medical reasons or whose immune system is compromised. This includes people being treated for cancer or HIV patients and more. When vaccine rates are high, a disease introduced into a community cannot take hold. Health officials would not be as concerned about the average PBE rate statewide -- but the rate hides clusters where PBE rates are significantly higher. In the Bay Area there are geographic clusters of vaccine refusals above 10 percent. Right now, California health officials are working to contain a measles outbreak that has reached 91 cases this month. After nearly a decade of low PBE rates in the 1990s, they started to increase in 1998. That was the same year a study was published that claimed a link between the measles, mumps, rubella vaccine and autism. The study was later debunked and retracted. But the damage was done. PBE rates have climbed steadily ever since, until now. The California Department of Public Health collects vaccination rates and PBE rates at every kindergarten in the state with more than 10 students — both public and private schools. Further below, we’ve made it easy for you to look up your own school. For years, Marin County has had the highest PBE rate in the Bay Area. In the 2013-2014 school year, the county's PBE rate was 7.57 percent. This school year, it declined to 6.45 percent. But San Francisco County saw a slight increase in its PBE rate from 1.64 percent last year to 1.80 percent this year. You can look up the personal belief exemption rate at your own school below. So you can see the trend, we include data from the 2007-2008 school year through the 2014-2015 school year, the most recent year for which data are available. This tool includes data from every kindergarten in the state, public or private, with 10 or more students. The column to the far right — “PBE” — shows the percentage of children at a kindergarten with a personal belief exemption on file. The higher the number, the more children are not receiving vaccines.